OLD BONES. By Trudy Nan Boyce. Read by Rebecca Lowman. Books on Tape. 10 ½ hours; 8 CDs. Atlanta is a powder keg after someone fires on a group of students from Spelman College who are demonstrating for police reform. One student from the historically black women’s college is killed, and several others are fighting for their lives. People are demanding answers. Sympathizers are pouring in from other cities. Police detectives are trying hard to figure out who the shooter was, trying hard to solve the other murder cases that haunt their thoughts, but having to take time from their investigations to don uniforms and help deal with riots in the streets. 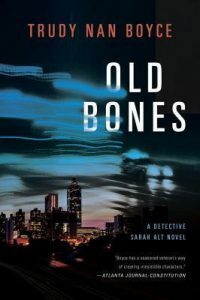 The situation that unfolds in Old Bones is not exactly just routine work for an Atlanta police detective like Sarah Alt, but it isn’t that atypical, either. For fans of detective and mystery fiction, it’s always a pleasure to discover a good series, with the prospect of many more books to come. I somehow missed Out of the Blues, the debut of the Detective Sarah Alt series by Trudy Nan Boyce. But now that I’ve found No. 2, Old Bones, you can bet I’ll go back to find that first one and eagerly await Boyce’s future offerings. 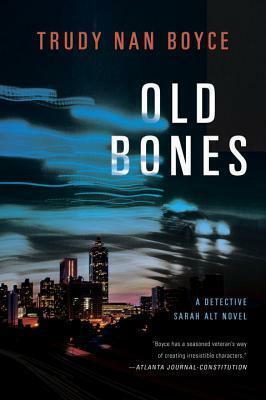 Sarah Alt, known by most people as Salt, is a young woman who, after doing her years on the streets of Atlanta as a beat cop, has recently become a homicide detective. Her father was also a cop in Atlanta, and her family’s roots are deep in rural Georgia near the city. She’s a police officer who strives to do her job well, and who also thinks about such issues as justice and fairness and what kind of prospects the kids who grow up in the projects have in life. She gets to know the people she deals with, and she cares about them. Boyce obviously is writing what she knows. She spent more than 30 years as a police officer in Atlanta, including time as a homicide detective. Before that, she earned a Ph.D. in community counseling. In the midst of the fallout from the Spelman shootings, Salt discovers that the decomposed body she’s called out to investigate is that of a teenage girl she arrested a couple of years earlier. Salt didn’t even know the girl was out of custody, but she feels a responsibility to find out what happened. Unfortunately, both events and people with questionable motives interfere with her investigation. This book has it all – the plot is taught and believable, with enough action and suspense to make it gripping. Salt is a complex and likable character, struggling with her own problems even as she devotes herself to her demanding job. There’s a romance, too, and it blends seamlessly into the rest of the story. Boyce portrays the tensions of Atlanta as a New South city, with plenty of good people, to be sure, but also slums, drugs and gangs intertwined with the legacy of slavery and racism. Boyce’s story and her prose are rich and accomplished. Rebecca Lowman’s reading of the audio version is a pleasure, and I’m happy to say she does not exaggerate Southern accents. This entry was posted in Detective fiction, Mysteries, Popular fiction and tagged audio book, Detective Sarah Alt, Old Bones, Trudy Nan Boyce. Bookmark the permalink.